Jawbone UP3 review: Up there with the best of them? The Jawbone UP3 is perfect for the person that wants a detailed log of how they slept and an overview of how many steps they take in a day. It is also perfect for those that need some extra motivation and its design means it can be worn all the time without looking out of place. The UP3 isn't as great for those that do a lot of gym work or want more detailed analysis of their workouts but as long as you understand what Jawbone is trying to achieve, the UP3 won’t let you down. There are plenty of fitness tracking devices available these days and Jawbone's Up series has been one of our go-to favourites. Now in its third generation, the Up3 is more capable than ever before. But unlike the Fitbit and Withings products of this world, which are better suited to those who want to track exercise, Jawbone's aim is slightly different: it's more interested in the time spent inactive and encouraging you to reduce this time. We've been spending some weeks with the Jawbone UP3 to see how effective it is and whether, like its predecessors, it can maintain its place as one of the hottest activity trackers around. 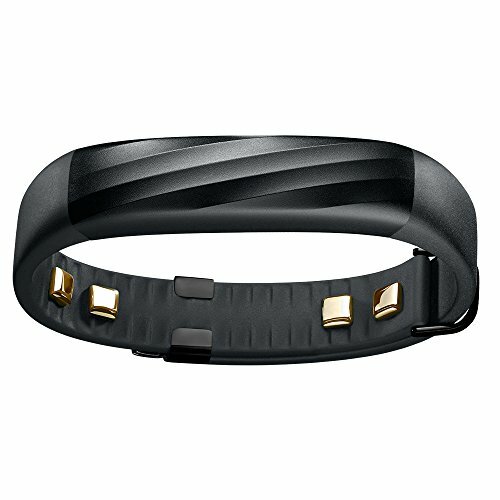 The Jawbone UP3 is by far one of the best looking activity trackers out there. It's slim, sophisticated, not too big or small and sits nicely on the wrist. It measures just 9.3mm at its thickest and weighs only 29g so it's barely noticeable when worn. There are a couple of different styles available – an all black model (as shown) or a black and silver model. Once it was on, we didn't take it off, not even for showering – don't worry, it's splash proof – or when wearing smarter clothing. It's suitable for all situations. The majority of the Jawbone UP3 is rubber but there is a hard plastic section that sits on the top of the wrist. This has a diagonally ridged detail that's slightly raised, which looks good but from a practicality point of view means the device is prone to picking up scrapes. Ours lost some of its external coating within the first couple of weeks, which isn't great. The hard plastic section isn't a proper screen display, as such, but there are three notification icons beneath it comprising a walking man, speech bubble and a moon which light up red, white and blue, respectively. We will go into a little more detail about these later. When it comes to securing the UP3, Jawbone has taken a slightly unconventional approach by using a small metal Jawbone-branded bracket that moves along the rubber band, while the two ends of the band feature a loop and a clip. As the clip end threads through the loop and then slides sideways into the bracket on the band it's awkward to get the bracket in the right place to ensure the best fit to begin with. We found the UP3 detached every so often too, waking up with it dangling off our wrist several times. It looks good but it certainly isn't the most secure fastening of the activity trackers available out there. On the underside of the band there are five gold-colour square sensors, each measuring around 5mm wide and sitting slightly raised within the textured rubber. Interestingly, the underside of the band is only textured on the side with the sensors and not the other but this doesn't impact comfort. The sensors are split up into two groups of two on the band itself, with the space between them being the extent of how far the bracket can move to vary the size of the UP3. Jawbone says it will fit wrists between 140mm to 190mm. The fifth sensor sits on the underside of the plastic section, accompanied by the four-pin charging dock. The Jawbone UP3 is charged using a special USB cable so don't expect the ease of Micro-USB. The dock is magnetised so the cable attaches easily but it's tricky when using a wall plug to charge it as the band sits too close to the wall and therefore detaches if not positioned carefully. It's a little easier if using an extension socket or a laptop for example, as the band can lie flat. In terms of battery life, the Jawbone UP3 is up there with the best of the bunch. We were able to get around five or six days from the 38mAh battery on board, with constant activity and sleep tracking. That's a good innings compared to its competitors. It also recharges in an hour, which can be done when at your desk or when you don't plan on moving for a while. Jawbone takes a different approach to monitoring activity than other competitors on the market. Rather than focusing on how much you move, the UP3, just like its predecessors, looks towards how much you don't move. When directly compared to the likes of the Fitbit Charge HR, the Jawbone UP3 could be seen as falling short. Although it does a range of fancy things, such as monitor your skin temperature, it needs you to input more information than the Charge HR requires, so it's a more hands-on approach. For example, the UP3 will recognise when you have done exercise (most of the time, anyway) but it then requires the user to input what the exercise was and its intensity. Following the input, UP3 will then provide more data – such as pace, calorie burn, distance and number of steps – based on the activity selected. There are a range of activities to choose from including tennis, yoga, elliptical and weights, among others, so the UP3 has the options. However, it doesn't always automatically identify the correct activity: when we did hot yoga and interval training on the treadmill at the gym, for example, we weren't able to log these as exercises unless we did it manually. Which is long winded. Given the number of sensors the UP3 has and the amount it tracks – such as respiration, galvanic skin response and ambient temperature – this is somewhat disappointing. The UP3 should at least have recognised we were doing activity when we did hot yoga for 80 minutes. For general step-tracking the UP3 is good, but not as accurate as the Fitbit Charge HR. While the Fitbit is accurate almost the exact step, the UP3 counted 122 steps for our 100 physical ones taken. So it's a bit over generous. The UP3 also monitors heart rate but it records resting heart rate rather than active beats per minute. This means the daily data provided isn't quite as detailed as you get from the Fitbit Charge HR, but the Jawbone UP app does present a breakdown of the number of active minutes, longest time active, longest idle, total calories burned, active calories burned, resting calories burned, distance and percentage of your "move goal" when you click on specific activities in the timeline. Sleep tracking tends to be the weakest area of an activity tracker, but with the UP3 things are different. Jawbone's sleep tracking is far superior to its competitors and although it's still difficult to determine the accuracy (as we're unconscious when sleeping! ), we love the data the UP3 presents. Along with length of sleep and percentage of sleep goal achieved, the app also details the length of deep sleep, light sleep and REM sleep, the last of which is said to be the dreaming state. It also indicates how long you are awake for, how long it took you to fall asleep and how many times you woke up during the night, in addition to your resting heart rate. The detail is plentiful; it's almost like Jawbone has taken note of the all sleep tracking data its competitors collect and rounded them into one to give you the best of them all. It's largely accurate, although there were some occasions when the UP3 didn't always pick up the times we woke up in the middle of the night for a few minutes. It also recorded us sleeping when our UP3 was actually charging all night, which was a little odd. Overall, though, the sleep-tracking capability of the UP3 is great and reiterates Jawbone's stance at focusing on measuring you when you are inactive. Our only complaint is that you have to put the UP3 into sleep mode, either through the app or the device itself, rather than it automatically detecting your state. Data is still recorded if you forget but we'd rather it was completely automatic. The Jawbone UP3 has plenty of features on offer, even after putting activity and sleep tracking to one side. There are no smartphone notifications so you won't know who is calling like you can on the Charge HR, but the UP3 makes up for that in other areas. Our favourite aspect is the Smart Alarm. This feature allows you to set an alarm within a defined 30-minute window. The UP3 will then wake you up when you are in the lightest sleep within the window you set, the idea being you wake up fresh rather than groggy. It's something Jawbone's competitors don't offer and we can't get enough of it. Sticking with the smart aspect is the second of the loveable features of the UP3: Smart Coach offers tips and articles throughout the day along with setting challenges, such as drinking more water, or walking a certain number of steps the next day. Smart Coach also presents various stats such as the percentage of UPsters who report higher energy levels after seven hours sleep. You can also tailor it towards you by pressing the heart to tell Jawbone you like a certain tip, or pressing the flag to tell it you don't. If you like food tips for example, more food tips will then start to appear. Smart Coach really grew on us over use, although some will see it as overkill and maybe a little too intrusive though. Last but not least of the notable extra features on the UP3 is the Duel function, which is something previous Jawbone users will be familiar with. The majority of the platforms in the activity tracking field have a competition element whereby users can add friends into their app – assuming they are using the same platform – and see their progress. Jawbone makes the idea of a little competition more fun, however, by allowing you to add other Jawbone users to your team and starting "duels" with them. These can be for 24 hours, three or five days, and the winner is the one who achieves the most steps. Within an ongoing duel, you can not only see who is winning but also how long is left to go, as well as leave comments and cheering or taunting emoticons. It's great for a bit of fun and if you have friends, family members or a partner with a Jawbone device, it's another fab feature for an extra bit of motivation. The Jawbone UP app, available for Android or iOS, is simple to use, easy to navigate and delivers a fuss-free layout. It's toned-down compared to the likes of Fitbit and Withings, yet similar to Withings in that it offers a timeline style on the home screen. The UP app's home section shows you everything that is going on. From any duels you are taking part in, to percentage updates of your step goal, Smart Coach tips, activities performed and sleep duration. If you have synced UP with a third party app, like the Withings Smart Body Analyzer connected scales, then updates from there will appear in this section too. There is a plus icon that appears at the bottom of the home screen which is how you manually log an activity, as well as sleep, food, weight and how you feel. The food logging works in a similar way to MyFitnessPal with a barcode scanner and a database of products to choose from but it isn't quite as extensive as MyFitnessPal which we preferred to use instead. In the top left of the home screen there are three lines that will bring up a menu. This is where team members are managed, duels are started and monitored, third party apps are added and goals are set. You can change your move, sleep and weight goal, which is useful, but less extensive than Fitbit's options when it comes to customising goals. This UP app menu also allows access to your profile where you can see all your achievements, change your profile picture, and there is a Trends section to view your daily, weekly or monthly progress. It's possible to customise what data you see here by pressing the three lines in the top right. On the right-hand side of the home section is a band symbol, which brings up another menu and the battery level remaining on your UP3. This section is how to put the UP3 into sleep mode using the app, set a stopwatch, Smart Alarm, idle alert, activity alert and any reminders. When sleep mode is activated, the moon symbol on the UP3 will light-up blue. An activity alert or accomplishment of your goal will light-up the activity symbol on the band red, while a reminder alert will turn the notification symbol white. The Jawbone UP3 is a great device for the Average Joe, one that can be worn all day and night, but it isn't necessarily going to be the best suited for everyone. It comes down to what you are looking for in an activity tracker. One the one hand the Jawbone is fantastic for highlighting how much you're inactive and then injecting fun and motivation into moving, whether through its Smart Coach feature or a Duel with a friend or partner. It also offers a great sleep tracking feature, has a decent app, battery life to last a working week, and provides detailed logs of sleep and an overview of how many steps they take in a day. But on the other hand it isn't as great at recognising a workout as some of the competition and the step-tracking accuracy should be a bit better. Compared to the Fitbit Charge HR, for example, there is no way to tell the Jawbone you are about to do an activity before you've actually done it, you just have to assume it will automatically detect so you can tell it what you did after. The UP3 also isn't as great for those who do a lot of gym work or want more detailed analysis of their workouts, such as active heart rate, while the fussy clip-in strap isn't our favourite out there. As long as you understand what Jawbone is trying to achieve, the UP3 won't let you down. It's up there with the best of them.